It is scientifically proven that our bodies are made of remnants of stars and massive explosions in the galaxies, that, through evolutionary processes, have given rise to biodiversity in, species, organisms, and molecules. In the mid-19th century, Charles Darwin formulated the scientific theory of evolution on his famous book The Origin of Species. This book, written for non-specialist, has generated scientific, philosophical, and religious discussion since its publication. Evolution and its process are a massive source of inspiration for artists, musicians, writers and designers who give birth to their creations while developing their personal style. In this challenge we want to hear your thoughts on evolution in a personal, social, or global level. Post a picture, song, video, collage, poem that depicts change, growth; evolution. To be eligible, the entry must be published between May 16, 2018 and May 23, 2018 (11:59pm UTC). Create a new entry that fits the guidelines outlined in the challenge’s description above. 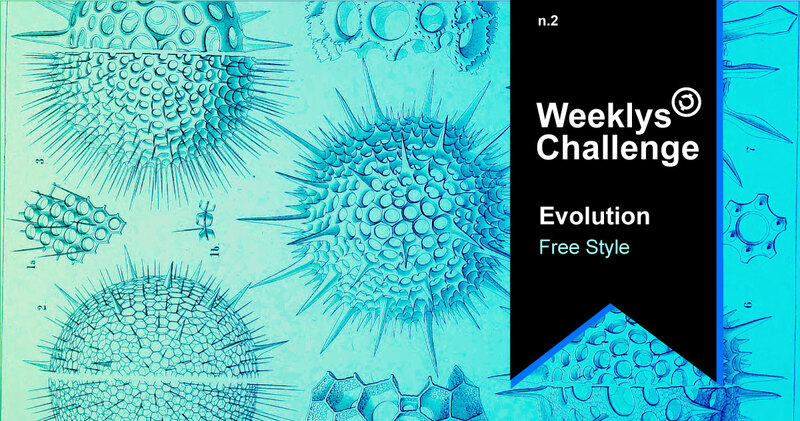 Upon publishing your entry be sure to add the specific tag for the challenge ( #evolutionweeklys ) and to apply the Attribution + ShareALike licence to enter to your entry. To be eligible, the entry must be published between May 16, 2018 and May 23, 2018 (11:59pm UTC). A panel of judges made up of Creativechain’s staff and respected members of the community rate the finalists. The averages of the ratings determine the Staff’s Pick winner. Creativechain’s members can vote (like) any number of entries until the challenge’s deadline. The two (2) entries that have the greatest number of votes (likes) will be awarded the Public’s Choice prize. When the winners are decided they will be announced here on the challenge page as well as on the Creativechain’s App. All winners will be notified when this happens. Overview; Object of the Challenges. The object of the challenge is to post a project that meets the Criteria and is submitted in accordance with the format, content and other requirements identified in Section A.6 (“How to Enter”) below. Eligibility. THE MATCH IS OPEN TO ALL NATURAL PERSONS WHO ARE REGISTERED MEMBERS OF THE NETWORK. No purchase or payment is necessary to enter the challenge or to become a registered member of the network, and no purchase or payment, including choosing to purchase CREAS will improve your chances of winning in any way. Deadline. The challenge begins at 12:00 am. Coordinated Universal Time (UTC) on the “Start Date“. Entries for the challenge must be posted by no later than 11:59 pm. UTC on the “Deadline” (both the Start Date and de Deadline are posted on the challenge’s page). Document your project in the proper format. Featured images have a maximum size of 2mb, downloadable content is optional for this specific challenge and can be any size and format you prefer. Open the Creativechain’s app and log in. If you are not already a member of the Creativechain’s network (CREA CORE), you will be required to download the desktop app and create an account, free of charge and with a reward. When ready to publish your project in the Creativechain’ network, click the “publish” button to enter your project. On the pop-up window of the app, enter your challenge entry on featured image, write title of your choice, a description and tags, remember to include the tag of the challenge, for as any project without the tag will not apply for the prizes. Enter the downloadable content (optional), the price should be left empty, for all applications must be free of charge for other users to download and share. Choose the license: “Attribution + ShareALike” or any other less restrictive license. You may not enter the same project in more than one challenge. Winner Selection. There will be three (3) total winners for the challenge. The winners will be selected two (2) days after the challenge’s Deadline. Each winner will be awarded only the prize(s) for which that winner was selected, as described below. The Staff’s Pick winner (1) will receive: 500 CREAS. The two (2) Public’s Choice winners will receive: 250 CREAS. Any awarded prizes will be provided to a winner the same day of the public announcement on social media and at the challenge page (www.creativechain.org/challenges ). The winner(s) will be solely responsible for complying with any and all applicable federal, state, provincial, local or other statutes, laws (including, without limitation, common law, if applicable), rules and regulations relating to the prizes and for bearing any personal income, VAT, withholding taxes, customs duties, or other taxes, fees, insurance, surcharges or other costs relating to receiving, claiming or collecting any prize. Judging. All entries that are in compliance with all terms and conditions of these Rules will be judged on the basis of the following criteria (the “Criteria“): clarity, ingenuity, creativity, relevance to the theme, and execution. Creativechain will establish a panel of at least four (4) artists and designers (each, a “Judge“), who will choose one (1) winner from the pool of all eligible entries. THE DECISIONS OF CREATIVECHAIN AND THE JUDGES WILL BE FINAL. CREATIVECHAIN WILL NOT CORRESPOND WITH ENTRANTS ABOUT THE DECISIONS OF THE JUDGES OR THE DETERMINATION OF THE WINNERS. Public choice. Out of the pool of all eligible entries, the Creativechain’s two (2) publications that, at the time of the finalization of the challenge, have the greatest number of likes, will be awarded the Public’s Choice Prize. Size of Entry Pool. Winning entries will be selected by the Judges in accordance with the Criteria as described in these Rules. The chances of any entry winning a prize depends on the number of eligible entries received between the Start Date and the Deadline and the quality of that entry as compared to the other eligible entries, as evaluated by the Judges in the manner described above. Creativechain does not know in advance the number of eligible entries that will be received and cannot predict or guarantee any specific number of eligible entries for the challenge. General Conditions. By entering the challenge, each entrant agrees to abide by the terms of these Rules and by the decisions of the Judges, which shall be made in all cases in their sole and absolute discretion and are final and binding on all matters relating to the challenge. These Rules are a legally binding contract, with equivalent effect to a private contract between each entrant and creativechain. The challenge is void where prohibited by law The challenge is created by Creativechainand other policies (collectively, the “Policies“) pertaining to the Sponsor Site, although the Rules will govern any conflict between the Rules and the Sponsor’s Terms or the Rules and the Privacy Statement. Exclusions from Eligibility. The four judges may submit entries in the challenge, but any such entries are for information and entertainment purposes only and are not eligible to win any prizes. Entry. Only one (1) entry per entrant is permitted and can win a prize in the challenge. Entrants must be registered members of the Creativechain’s network to enter the challenge. Registering for a Creativechain’s account is free of charge. Entries can be the work of more than one person, but for purposes of the challenge, each entry will belong to the “Primary Author” named in the entry, regardless of the number of contributors to that entry. For winning entries, Creativechain will award the applicable prize to the entrant publisher only. Upon submission, all entries become subject to the licences. Entries will not be acknowledged or returned. Entrants are permitted to modify or update an entry after submission after the Deadline, but are not permitted to delete them. Entries may remain posted on the challenge page of Creativechain’s Site indefinitely following the Deadline and may be deleted at any time in its discretion. Entries may not be submitted through any software-generated, robotic, programmed, script, macro, or other automated method. Creativechain will have no responsibility for, and will have the right to ignore in its discretion, any entries that have been tampered with, or entries that are misdirected, incomplete, non-conforming, corrupt, lost, late, or ineligible, whether due to the Creativechain’s App failure or otherwise. Use of Personal Information. Registering for an account with the Sponsor Site, which is required to enter the challenge, does not require to fill in any personal details all details added to the personal profile are optional, and Creativechain holds no responsibility. For further information concerning how Creativechain handles personal information, consult Sponsor’s Privacy Statement. Entries must not have been published prior to the Start Date. Entries must not have been entered in more than one challenge. Entries containing: threatening, harassing or hateful content will be ignored by the judges. Voting Period. During the period of the challenge until the day of the Deadline, all members Creativechain’s network may vote for their favorites entries by clicking on the like icon. There is no limit to the number of entries for which a registered member can vote. All votes must be voluntary and uncompensated. Votes may not be cast by any automated method. Creativechain may ignore any votes that have been obtained in violation of these Rules. Selection of Finalists: In the first round, after the Deadline, the Judges will select their favorite 20 of the eligible entries (five different entries per judge). Selection of Winner(s): In the second round, the Judges will apply the Criteria to evaluate the finalists, using a range voting method, assigning a value between 0-9 to each finalist. The finalist with the highest score will be selected as the winner. Any ties will be broken using the median ballot rating approach (the entry with the highest median score wins). The challenge is entirely skill-based and contains no elements based on chance. The standards applied during the judging process focuses on assessing each entry’s properties. By the mere submission of an entry, an entrant acquires no automatic awarded a prize. Prize Terms. All values are estimated in United States Dollars (USD) as indicated. No prize is, and the winner(s) have no right to claim that any prize is, exchangeable, transferable, or redeemable for cash. The winner(s) will be solely responsible for all expenses related to the receipt and use of all prize(s). The winner(s) will be solely responsible for complying with any and all applicable statutes, laws (including, without limitation, common law, if applicable), rules and regulations and for bearing any personal income tax, VAT, withholding taxes, or any other taxes, fees, insurance, surcharges or other costs relating to receiving, claiming or collecting any prize. Announcement; Award of Prize(s). The winner(s) will recive a notification on the Creativechain’s App within two (2) days of the Deadline. Representations. By entering the challenge, each entrant represents and warrants that: (a) the entrant meets all eligibility requirements of the challenge; (b) in entering and participating in the challenge, the entrant has complied and will comply in all respects with these Rules. Assumption of Risk. By taking any action to create an entry for the challenge, each entrant, on his or her own behalf acknowledges and agrees that: (a) ENTRANT HAVE THE SOLE RESPONSIBILITY FOR THE CREATION OF THE ENTRY, WHICH IS DESIGNED AND CREATED BY THE ENTRANT FOLLOWING HIS OR HER OWN DECISION AND INITIATIVE DEPENDING ON THE WAY, IN HIS OR HER SOLE DISCRETION ENTERANT DECIDES TO CREATE SUCH ENTRY, AND EVEN THOUGH THE CHALLENGE DOES NOT REQUIRE OR OTHERWISE ENCOURAGE DANGEROUS BEHAVIOR, THERE MAY BE DANGER AND RISK OF BODILY INJURY, DEATH, OR PROPERTY DAMAGE INVOLVED IN CREATING AN ENTRY; (b) THESE RISKS AND DANGERS MAY ARISE FROM FORESEEABLE OR UNFORESEEABLE CAUSES; (c) SUCH ENTRANT ASSUMES ALL RISKS AND RESPONSIBILITY FOR ANY PERSONAL INJURY, DEATH, PROPERTY DAMAGE, OR OTHER LOSS ARISING OUT OF THE CREATION OF ANY ENTRY, WHETHER CAUSED BY NEGLIGENCE OR ANY OTHER CAUSE; and (d) Subject to applicable law, such entrant is relinquishing any and all rights he, she, or they now have or may have in the future to sue or take any other action against Creativechain or, any other entities involved in the administration of the challenge, on the basis of any injury, death, damage, or other loss that may be suffered arising from any action taken in the creation of any entry. Release. By entering the challenge, each entrant releases and holds harmless Creativechain from any and all responsibility, liability, damages, losses, costs, or expenses of any kind arising out of or relating to: (a) entry or participation in the challenge, including but not limited to disputes among individuals claiming to have contributed to any winning entry; (b) any violation by the entrant of these Rules (c) misappropriation, infringement, or other violation of any copyright, trademark, patent, trade secret, right of publicity, privacy, or other legal or contractual right of any person attributable to entrant or any entry submitted by entrant; (d) any entries or votes that have been tampered with or that are misdirected, incomplete, non-conforming, corrupt, lost, late, or ineligible; (e) any problems or technical malfunctions (including but not limited to errors, omissions, interruptions, deletions, defects, or delays in operation or transmission) of any computer, telephone, modem, cable, satellite, network, hardware, online system, server, software, or other equipment or provider, including any incorrect, incomplete, garbled or jumbled information resulting therefrom; (f) any Internet traffic congestion or website accessibility or delays; (g) printing or typographical errors in any challenge-related materials; or (h) any other technical or human error that may occur in connection with the challenge. Misconduct. Creativechain may ignore any entrant who: (a) tampers with the entry or voting process, the operation of the challenge, the Creativechain App, or affiliated websites; (b) acts in an unsporting or disruptive manner, or with intent to annoy or harass another person; or (c) is otherwise in violation of these Rules, the Policies, or any applicable laws. Termination. Creativechain may modify, or terminate the challenge at any time for any reason, in its discretion, including without limitation in the event of fraud, abuse, tampering, technical, administrative, financial, or other difficulties. In such cases, Creativechain will post a notice on the challenge page of the Creativechain’s Site. Any entrant may withdraw from the challenge at any time by contacting Sponsor by erasing the challenge tag from their entry. License. By correctly entering the challenge, and therefore applying the “Attribution + ShareALike” license to the published entry, each entrant grants the community the right to share (copy and redistribute the material in any medium or format) adapt (remix, transform, and build upon the material for any purpose, even commercially) always giving the appropriate credit, providing a link to the license, and indicating if changes were made. If anyone may remix, transform, or build upon the material, the must distribute their contributions under the same license.